Some of you received an email about my fishing course I was teaching. It is detailed on my Tip of The Week page. I taught the 4 night course two times last winter. Why I Took Charlie “Turk” Gierke’s Walleye Fishing Course – Piece It Together Like a Pro. I am seventy years old. 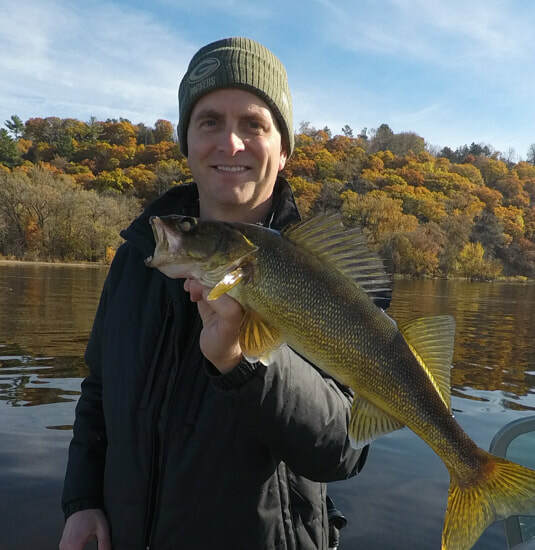 I have fished walleye in Minnesota, Wisconsin, the Dakotas, and Canada since I was five. I fish mostly in the spring and fall because that is when I can catch walleye on a regular basis. I am a sucker for success. Like most guys my age I have fewer fishing partners today than twenty years ago. About ten years ago I cultivated a few younger men to fish with as my old buddies aged and I watched them give up cold weather fishing after age sixty-five. My new pal is a walleye enthusiast and fifteen years younger. He loves to portage and paddle after walleye. 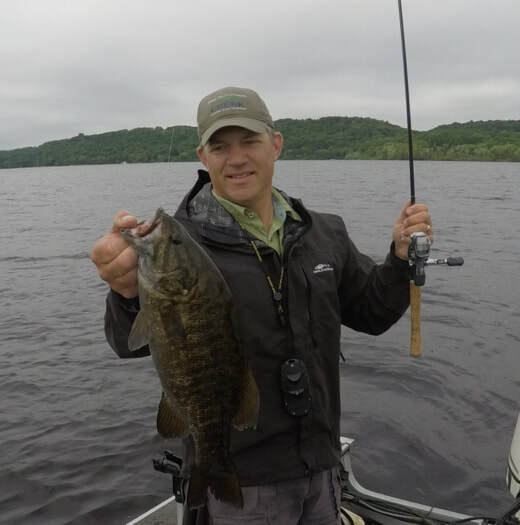 He also loves to fish North and South Dakota as well as the St. Croix River. He has made me a more enthusiastic walleye fisherman and he has made me a better walleye fisherman. So when my pal comes over to pick up his share of the goose sticks from a Christmas goose hunting trip to Montana and is hyper excited about a course in walleye fishing he has just completed – I paid attention. He explained that his whole approach to walleye fishing has been altered – I stopped him. Wait, says I, you know how to fish walleye. No, he says, think of a walleye shaped jigsaw puzzle. Mine had all the pieces lying on the bottom of my tackle box but I never put them all together. I have been skunked a lot. I have never liked it. I do OK in the spring and fall but in between I fish but I do not catch much. Then he said the magic words: you have to take the course. Why, I want to know? You can just tell me what was in the course. No, he said. I could read the whole thing to you and you would still not get it. There is a cost for it. Sure there is. You know how I am about money. It was worth it. It has changed my whole approach to walleye fishing. Lucky for me I heard from my pal that there was another course session starting the following week. I signed up and arrived at the class location along with eleven other walleye hunters. The group was filled with experienced walleye fisherman however after taking the course I wish I had taken it as a novice. My walleye path would have been paved with many more fish. I should note that Gierke just put this jigsaw together after twenty years guiding walleye fisherman so I got it as soon as I could. I now feel like I have all the pieces to my walleye jug saw in my tackle box and the knowledge to put them together to enhance my fishing experience. I feel confident I can fish where the fish are with Turk Gierke’s new system. MORE Zebra Mussels Transfer Culprits but there is Hope -Nature Takes Care of Itself. For what seems like 25 years us river anglers on the Mississippi and St. Croix have had to deal with zebra mussels. When they first came on the scene it was obvious that they were a large infestation on the flowing waters. Bring up a log or any drowned river object and they were covered by zebs. If you were trolling and bumping bottom with a crankbait you could have your line cut when the Rapala went by a zebra mussel covered rock or downed wood. There were stories after stories of zebs clogging intake pipes from water plants or power plants. Since the story broke of zebra mussel infestation popping up on new lake after new lake, the tale went that zebra mussel veligers (their smallest form) are transfered by anglers bringing bait buckets from one body of water to the next and through water transport via livewells. Many anglers like myself have thought and rightly so the above is true, but that there are many others ways water gets transported. Ways such as the mechanical design of motors to use water for cooling transports water, or wet areas of wave runners. Other places like carpet covered bunk trailers are always wet transports water too. In fact last summer I was thinking of this topic as I noticed I had two small trees growing in the rear end carpet fold on my boat trailer. These sprouts had fallen in the crevice and clearly found enough water to grow. Surely a veliger could find a brief home in this same spot. 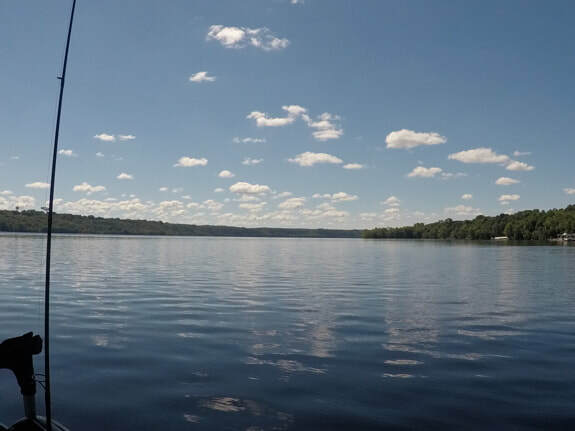 So today I find this headline: Zebra mussels’ best friend: wakeboard boats, new U study finds. Finally there has been “evidence” of what we as laymen always knew -- that zebra mussel veligers get moved through processes other than by joe fisherman’s bucket and livewell. It is confirmed what many of us knew, but this isn’t good news it means that we can never stop the spread! We can’t, but hold on, there is light at the end of this tunnel, it might take 20 years but I believe there is light. Here is why. One thing I believe that is not commonly found in print is the idea that the longer the zebs are in a particular body of water that their population falls over time. I have only anecdotal evidence from The Saint Croix but the volume of my anecdotes carry reasonable weight as far as I’m concerned. In 2018, when you snag an old rope, or anchor, lift up a sunk branch, raise an old fishing pole, what do you not see in abundance or at all, something I used to see 20 years ago? Yep zebs. Not a scientific study? I agree, but as far as I know that is exactly how zeb densities are studied by observing and counting on test drop sites. I understand this testing involves the lifting of objects and counting the zebs numbers. Sound familiar? I have done this same study for 20 years albeit unintentionally. So how is this possible? I believe that in time fish like perch and sunfish pick and peck at the zebs and eat them and control the population. The boom in time even the zebs become just another specie in a lake. In fact I found research showing this belief of mine that fish eat zebra mussels in a fisheries study. I would guess there will be a huge overreaction to the study finding wake boats as culprits to the spread, and a large discussion about engine redesign. I feel it is all overblown and in time it will be just as the Saint Croix today. I am not advocating transporting water through bait buckets and livewells or doing away with AIS laws. What I am advocating is ratcheting down the gloom and doom rhetoric about zebs as I believe, in time, the population explodes with a boom, then busts – as nature, and not us humans, takes care of itself. Next guide season is on Pool Four. What a great fishery down there! Wow. I launch out of Everts Resort and have now close to 20 years. Everts is a special place because of the workers and the fishing community there. You find all walks of life and some very very good anglers. The Everts Bait Shop is the best flat out river bait store I have been in. Mid November. Snow in the boat! If it wasn’t for the wind it would’ve been heavenly. I pulled into a fishing location I know like the back of my hand, but with the flurries I was all turned around and it was an erie atmosphere like a dreamscape. The I had to snap out of it to strart baiting up hooks they way I like it done and then started explaining presentation deployment and the bite. The the wind kept blowing. We started fishing, I landed a fish right away and showed the guys a 17″ walleye, it was funny because two of the three guests didn’t even notice me reel in a fish. A similar event happen recently as well, where you get a nice one right away and that relieves peoples' minds as to why are we out here fishing when its snowing?! Because the bite is good – and you’re a little bit nuts too. I really enjoy this time of year. The places I launch are winding down for the year. The dock pushers are about done for the year pushing the endless amount of residential dock up and down the river, and its just the end of the season everywhere else. Kind of the last hurrah. Long time ago I that guy that stay really late at the party and closed it down for good or bad. I have been closing down the St. Croix River for about 20 years now and fishing this bite many many days. That will end someday, but not now not this year. The river gets so crazy busy in the summer that hanging out one on one with this lovely lady is just really great. Loons, immature Loons are still here and have been for a good moth. Very nice birds, and though they are immature juveniles they still know their tell-tale songs very well. Below is a survey from the Lake City Area fisheries department they are proposing some changes like keeping only one walleye over 20″. This is better than no restriction such as they have now! Also they are looking to change white bass limits from 25 to 10! Nobody needs to keep 25 white bass. Please take the time to do the survey, it ends in about two weeks. If you fish panfish, walleye, smallmouth, or finesse rigs for largemouth bass you are certainly familiar with the spinning reel. Spinning reels come in three designs: top drag, rear (bottom) drag, and the bait runner. I will talk about the first two here in this article where I take a stand that fly’s in the face of popular opinion and that is – the rear drag is a superior design for most freshwater applications. Of the three mentioned designs the top drag spinning reels are the most commonly sold and used by anglers. The top drag reel design has the drag adjustment knob on the top of the spool. Not as common now and in the past more prevalent, the rear drag spinning reel has the drag adjustment knob mounted on the bottom of the reel. As I recall years ago the top drag and the rear drag spinning reels were about equally offered merchandise sold in stores, and over time the top drag reels dominated the shelves. About 20 years ago I remember one of the industry’s leading experts explaining that the top drag-spinning reel is far superior to the rear drag because it was a stronger drag. I, like the rest of you, slowly started to buy exclusively top drag spinning reels to a point where over time that’s all I owned. I bought it because it was stronger, and because that’s what everyone was doing. Hey stronger is better, right? As stronger reels are better to fight fish with, makes sense… bye bye rear drag. Then one day last year I had two reels crap out on me and I bought two reels of the same model, make, and size that I thought were two top drags. When I got back home I saw I bought the same model, make, and size, but one was a rear drag. I cursed and didn’t have time to make a return, I needed the rigs ready for a guide trip the next day. This is how I was reintroduced to the rear drag. I forgot how much I liked using the rear drag reels based on the drag accessibility. What I mean by drag accessibility is the top drag is completely clunky in actually loosing and tightening the drag in the heat of the battle. As you know when you fight a big fish there is a lot of action and making the drag adjustment on a top drag with the fishing line exactly in the way of your hand is tricky. The rear drag is located exactly on the bottom of the reel out of the way of the fishing line. Many things can happen when you are fighting a fish and placing your hand in front of the reel on the top and trying to make and adjustment can be tricky. What I have seen happen over the past 20 years of guiding is a big fish comes in easy and when it sees the boat or gets close- it makes a run – a fisherman stumbles clumsily trying to loosen the top drag as the fish makes a strong push hard away and breaks the line. So you say, “why not just have the drag set so the fish can run to begin with – then you don’t have to worry about adjusting the drag on a big fish?” Good question. I will tell you why. For many freshwater fishing applications monofilament is the best. For example fishing bait in 25-27 feet of water or shallower you want mono. What is mono’s best fish catching point? It’s that it has stealth; it stretches, so the stretch lets the fish take bait and not feel you instantly like braid does. However the problem with stretch is that it makes hook sets not a solid. Especially with the commonly used 6 pound line. Here is where the drag talk comes in and this is the crux of my argument. You need you drag maxed out when setting hooks especially when fishing mono. After the hook set then you loosen the drag when you feel the fish. If while fishing you have your drag set for a fish to run, as many people do, the drag will slip upon the hook set, essentially making the mono line even more stretchy. You will not get the best hook sets with a drag that slips upon hook set. Here is where the rear drag comes in. When you get a big fish its not always completely known that it’s as good as it is. Sure sometimes you know you’ve got a hog right away. Take Smallies for example, they often grow in size as the fight progresses. Then if you drag is maxed out in tightness for proper hook setting and it makes a beast of a run making the adjustment with a top drag is clumsy and I have seen anglers not loosen the top drag fast enough! Not so with the rear drag – and this is why precisely it was designed. The knob is so accessible and a simple half knob rotation to loosen the drag can happen as fast as the fish can run. You may still be stuck on the “ stronger drag” theory of why you use a top drag. I grant that argument. However an Allison transmission is stronger than what I have in my standard 1500 Silverado, I don’t need an Allison transmission because I’m not hauling farm impliments. I’ve had one fish in my life fry my drag and that was a 5 pound bonefish in the Virgin Islands. My drag locked up during the fight and was ruined after that – it was a freshwater top drag btw… There is NO freshwater walleye, bass, panfish that is going to fry your drag. It is not going to happen. So why do you need a drag that a salt water angler needs?